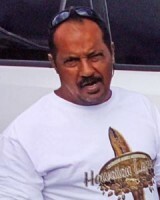 Hawaiʻi Island police are asking for the public’s help in identifying a man wanted for questioning in connection with a terroristic threatening case. A 57-year-old California reported that he was threatened at 2:30 p.m. Sunday (January 31) while in a parking lot on the 2100 block of Kanoelehua Avenue in Hilo. Police obtained a photo of the suspect. They ask anyone who recognizes the man in the photo to call the Police Department’s non-emergency line at 935-3311. Hawaiʻi Island police received numerous tips from the public about the identity of a man wanted for questioning in connection with a terroristic threatening report Sunday (January 31) at a parking lot in Hilo. As a result, police identified the man and have made contact with him. The public is thanked for providing tips.